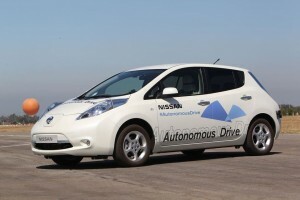 Nissan automotive has said that it will accelerate the development of the autonomous, hands-free vehicles, which will use a 360-degree camera system (dubbed ‘Around View’) as well as laser scanners in order to drive themselves. The scanners will be linked to a computer system to constantly monitor the surrounding area. The company claims that the vehicles are on track to be marketed by 2020, with CEO Carlos Ghosn referring any doubters to the fact that Nissan made bold promises about emission free cars several years ago and delivered. He said: “Nissan Motor Company’s willingness to question conventional thinking and to drive progress is what sets us apart. “In 2007 I pledged that – by 2010 – Nissan would mass market a zero-emission vehicle. Today, the Nissan LEAF is the best-selling electric vehicle in history. The firm has tough competition from Google however, who have tested autonomous Toyota Prius cars for over 300,000 miles without accident. The internet giant has said that these cars could be on the road as early as 2017. CarSite.co.uk has more information about the current Toyota Prius range.